The Atlanta Falcons emerged 23-20 victors as they piled more NFL misery on the struggling New York Giants. New York fell to 1-6 for the season after falling to Atlanta at Mercedes-Benz Stadium on Monday. The game had all the makings of an exciting contest: an elite quarterback in Matt Ryan, a seasoned pro in Eli Manning, two great wide receivers and an explosive rookie running back. But, the teams combined for more sacks than touchdown and one of the most sluggish first halves in the last seven seasons. 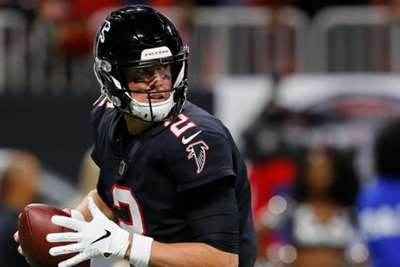 Ryan played through the pressure and lifted the Falcons, connecting with tight end Austin Hooper and receiver Marvin Hall for two of the longest play of the day, including this 47-yard touchdown pass, and never looked back. Manning and the Giants could not get Odell Beckham Jr. or Saquon Barkley going and sunk deeper into the NFC East standings. A late rushing touchdown from Barkley and a last-second score from Beckham stopped the bleeding but New York could not crawl out of their deficit. Manning was waiting for his moment. Ryan got his with the first touchdown pass of the game, but it would take the Giants quarterback a whole lot longer. Giants veteran Manning had opportunity after opportunity to inch just a little bit closer. There was just one problem, he could not capitalise on them. He finished the game 27-of-38 passing for 399 yards and one touchdown, but when push came to shove the Giants buckled. And, the coaching staff were not much help, either. Late in the game, New York were within striking distance. The Giants scored a touchdown with five minutes left in the fourth quarter and had a chance to pull within seven with an extra point, but a botched two-point conversion attempt set them back. Again, a late touchdown with five seconds left put New York within three. But, questionable play calling did not give the visitors enough time after the score as two quarterback sneaks milked the clock in the final minute. Why go for the keeper with time winding down? Why test a red-zone offense that was already shaky? The Giants were successful just once in four red-zone appearances before Beckham's touchdown. The decisions left New York on the losing end when they were in desperate need of a win. When looking at the sack totals, you would think each team had a good pass rush — that is not the case. Both teams entered the game ranked at or near the bottom of the league in sacks. Atlanta had 10 and New York were tied for a league-worst with seven. But on Monday, the Falcons and Giants combined for seven total sacks. Yes, the pass rush was good but the offensive lines were worse. There was little protection for each quarterback and the play callers handled each situation well, but Ryan outplayed Manning thanks to his receiving corps. The trio of targets gave Ryan plenty of options for quick releases when facing pressure. Manning, who connected with Beckham eight times, could not utilise Barkley, the Giants formidable running back. The Falcons extended plays by taking advantage of all their lanes, but Manning could not do the same — with the garbage time scores being the only exception. There is no question that Beckham and Julio Jones are two of the best receivers to ever do it, and Monday proved that. It was not a standout performance by any means, but it was a record breaking one. Beckham reached the 5,000th career receiving-yard mark and did so in fewer games (54) than any player since the 1970 merger. The wideout he passed? Jones. The eight-year veteran reached 5,000 in 56 games. How exactly did Beckham reach that milestone? Only in the most OBJ way possible. Beckham finished with 143 yards on his eight receptions. He also tallied the late score. Jones led the Falcons with 104 yards on nine catches.